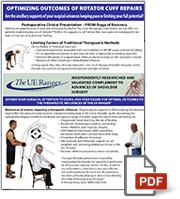 View or download the UE Ranger Clinical Applications manual. 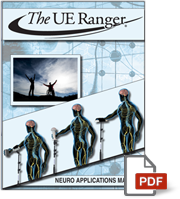 View or download the UE Ranger Neuro Series Clinical Applications manual. 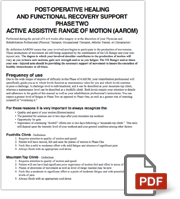 View or download the patient post-operative home exercise program. View or download our General Marketing Flyer. View or download the Rotator Cuff Marketing Flyer. While it is not a guarantee that your insurance provider will reimburse your cost, some have found success if they have their Physician complete the Medical Necessity & Prescription form. Your Therapist can assist you in this process. Attach the completed form with a receipt of purchase and submit both to your insurance provider. Click here to download the patient medical necessity & prescription form. "I am just one week into the UE Ranger and can hardly contain my excitement! At least 50% of my practice are shoulder patients; tendonitis to replacement and everything in between. As a 20 + year PT and Polestar Pilates Instructor, it is a rare occasion that something new comes along that merits investment of my time or money... until now. 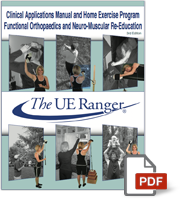 The UE Ranger is an incredible rehab tool and worthy enough that my 80 year old, fixed income Medicare lady (Helen) wants to purchase the Ranger after using it one week in the clinic. For a person of her generation to want to pay out of pocket for a therapy device is a testament in itself. Moreover, prior to the Rangers arrival Helen wanted to stop her therapy due to slow gains. Helen easily achieves 20 to 30 degrees more motion when using the Ranger. Functionally she cannot even walk up the wall (DX: severe fracture/ replacement 6/1/09 with subsequent frozen shoulder). Functionally the UE Ranger rocks! All of my rotator cuff patients love the new moves they are able to do with such ease. 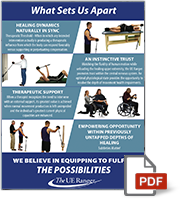 I plan to recommend the UE Ranger to all my post-operative shoulder patients."